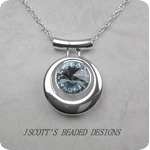 This necklace was assembled by me using a genuine Swarovski Blue Shade Rivoli. The pendant is high quality silver over pewter setting. Included is a silver plated chain with lobster clasp.